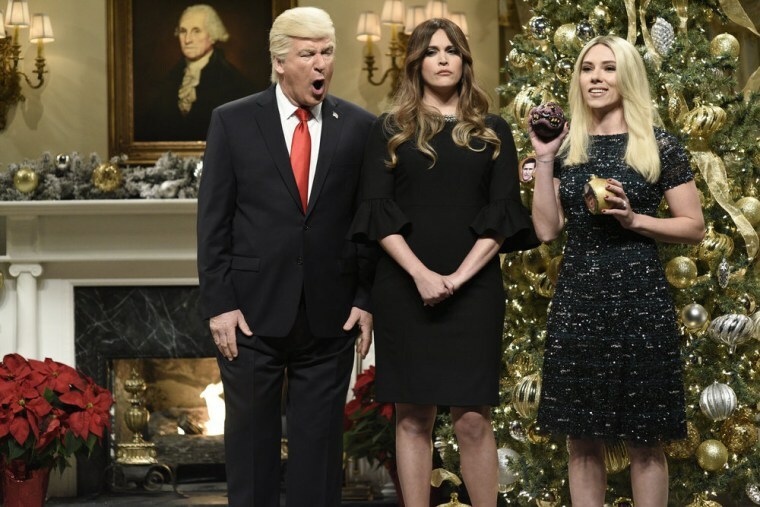 Alec Baldwin dropped by a Christmas-themed "Saturday Night Live" this week to deck the halls with barbs about President Donald Trump and pay tribute to the notable names who defined the year in politics. In the cold open, President Trump (Baldwin) and Melania Trump (Cecily Strong) decorated the "Tree of Shame," hanging ornaments adorned with photos of fired FBI director James Comey, former press secretary Sean Spicer, and other "haters and losers." The president and first lady were joined by White House counselor Kellyanne Conway (Kate McKinnon), press secretary Sarah Huckabee Sanders (Aidy Bryant), Vice President Mike Pence (Beck Bennett) and recently departed aide Omarosa Manigault Newman (Leslie Jones), who banged on the window and demanded to be let inside. They also welcomed a surprise guest: Ivanka Trump, played by Scarlett Johansson. "Ivanka, you made it! But where's Jared?" Baldwin asked Johansson, referring to his son-in-law Jared Kushner. "He's packing a go-bag before the FBI arrives," Johansson replied. "I'm going to miss him," Baldwin confessed. "Yes, me too," Johansson said. "I'll always remember that one time I heard him talk." After a brief visit from Donald Trump Jr. (Mikey Day) and Eric Trump (Alex Moffat), the first family turned their attention to the "elf on the shelf": Attorney General Jeff Sessions (McKinnon again). McKinnon's Sessions wanted to put the angel on the tree — an angel with special counsel Robert Mueller's face. "We got to cut off the head to kill the snake," McKinnon's Sessions said, apparently referring to Mueller. "And I should know because I'm a mischievous little mongoose." Political headlines also dominated "Weekend Update," with co-anchors Colin Jost and Michael Che mocking apparently defeated Alabama Senate candidate Roy Moore. "Congratulations to Alabama's newest senator: Not Roy Moore," Jost said of Democrat Doug Jones, who is projected to have won the special election there this week. "Doug Jones has become the first Democrat to win a Senate seat in Alabama in over 20 years," Jost noted. He then took a shot at the sexual misconduct allegations against Jones' Republican opponent. "Said Roy Moore: 'Gross! Over 20 years?" Che observed that black women helped fuel Jones' win, but quickly added that the Democratic Party would probably soon take them for granted. "Democrats know that black people aren't really Democrats," Che joked. "We just vote for the guy that looks less likely to put us on a boat." Comedian and actor Kevin Hart hosted the episode. The musical guest was the Foo Fighters. 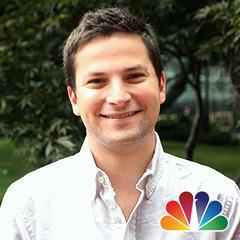 Daniel Arkin is a reporter for NBC News.